In previous blogs, we discussed the use of social media and re-marketing, but we did not talk about ways of using your online marketing budget to grow your small business. There are plenty of ways to promote your business online, but first you need to determine your online budget. Your online budget is not just what you spend on online advertising, but also includes the resources that you dedicate to it. First is how much you want to grow your business. Growing your business too fast and too soon for you to be able to manage your current customers and the amount of business you hope to gain from your online marketing, could be a key factor. You do not want to alienate your current customers. You have to consider the industry your business operates in. Are your customers business-to-business or business-to-consumer? More importantly, if your customers are business-to-business operations, how much do they rely on online marketing to make their purchase decisions? What is the size of your business and what is your expectation of competing with your competitors online? Getting into bidding wars with larger competitor for online ads and search-engine marketing could swallow up your budget and leave you with little results. Consider your business model and how ‘online-oriented’ your business is. Knowing your business and how much pre-sale and post-sale attention your customers expect from you will factor into how much attention they will pay to your online activities. 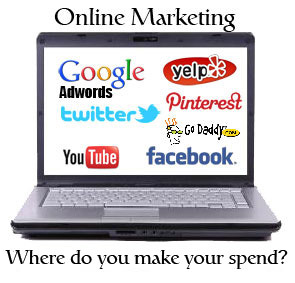 What effect will your online marketing have on your offline marketing? Consider not only what your online marketing will cost in terms of dollars and cents in taking money away from your offline budget, but how much attention and time it will take away from your offline marketing activities. Taking these factors into consideration will help you to avoid costly mistakes that could take your small business from being a hero to a zero. The more you know about what your competitors are doing, and doing right, is ,key to the success or your online activities. Finding ways to outsmart (for now) your competitors and staying ahead of them, has to be the focus of your online marketing. Once your competitors see what you are doing to maximize your online spend, the will copy it. The idea is to keep some of what you see working under wraps and save those strategies for another day.